O k a y. This book was a lot and I don't know how I'm gonna write a whole review without spoilers but writing one with spoilers would honestly be a dissertation so I'm gonna stick to the former. The book (an 880 page behemoth) is divided into three parts (plus an epilogue) and I want to review those parts separately, instead of just talking about "plot" as a whole. This first third was excellent as not just set-up to the climax but as a portrayal of characters and character development. It also set the tone for the story. In Lady Midnight, the primary focus is on Emma and Julian, and the narration stays mostly on them. In Lord of Shadows, that focus expands a bit, but still follows a central plot thread. In Queen of Air and Darkness, we experience something different: the characters are split up. We follow some characters in Faerie, some in Idris, some at the Scholomance, etc. The story never stays on one set of characters for too long before checking in on another group. Personally, I was a big fan of telling the story this way. First off, the last two books introduced us to so many characters that are so unique in personality, and even though the page-time wasn't really divided down the middle (some plot threads took more precedence than others, you feel), I loved getting to read about them in more close-knit situations, instead of as part of an ensemble. I loved really experiencing how the Blackthorns & company were grieving their recent loss, and what it meant for all of them. The second reason I loved telling the story this way is a purely subjective personal delight, but I'm a huge fan of fun B-plots in stories (books, television, all forms of story consumption). The book begins at a pretty vulnerable time for our characters, so "fun" isn't 100% the word I'd use for the B-plots but I loved that they were engaging, lovely to read, and provided a natural course to the ensemble getting together in the climax. There's actually a lot more I want to say about this section but it's all spoilers so I'll just say that one of the biggest positives was the way grief manifested in every single character. This was 100% my favorite part of the three!! So, Thule is the location where the first half of this second part takes place, featuring Emma and Julian (mostly) and that's as much as I can say without spoilers. This is probably the biggest chunk in the book where we just follow these two and no one else. While reading part one, I had lowkey guessed what type of place Thule was going to be, but not in any sort of detail, and I loved slowly gaining all the details through Emma's and Julian's time there. This middle part is my favorite for a few reasons: first, it pulls us out of the locations we've been sort of stuck in for the past few books and brings us somewhere new. In Thule, things are drastically different and as Emma and Julian recontextualize everything they know, we as the audience do too. Second: it's not just a side quest. This is hard to talk about without spoiling the whole book, but I'll just say that they gain valuable information from what's happening in Thule that they can later use in the third act of the book — it functions beyond a simple detour for our protags before they complete their quest. Third: everyone in Thule is badass and if you've read the book you'll appreciate this more. Fourth: the second half of part two happens after they return, and most of our key players are together. I loved this half especially because beyond the Thule stuff, there's been other inciting incidents and the overwhelming feeling is one of coming together and rallying for a common good. So even though I loved the book as a whole and I think the climax was pretty epic, the pacing did get a little weird in part three, which is why I knocked my rating down to four stars. It felt simultaneously like too much was happening too fast and like not enough was happening and it was too slow. I could see it potentially working up until a certain b i g scene, but the "and here's how it all ended up" felt very drawn out. Other than that, it was all excellently executed and hit all the right beats to make the audience excited and nervous and all the other climactic feelings. I also really loved how Julian's personal journey was bookended here with part one, in comparison to his time in Thule. I don't think I can say anything else about this because it's literally the end of the book so it's all #spoilers. I felt like there were a lot of the TMI characters in this — moreso than in the other books. And while I'll take an infinite amount of Magnus and Alec, I'm not always a huge fan of toooo much crossover. I like when characters pop in a little and then leave. They weren't around for an obnoxious amount but it wasn't my favorite aspect. I will say, however, that the epilogue hinted at more Jace/Clary in what I assume will be The Wicked Powers and I'd actually like to see that, only because of the specific context. I don't know if I mentioned this in my other two reviews, but the way Cassandra Clare writes about Los Angeles feels so authentic. I've never felt that her location descriptions were lacking or anything, but she brings so much heart into her description of LA that the location comes alive. 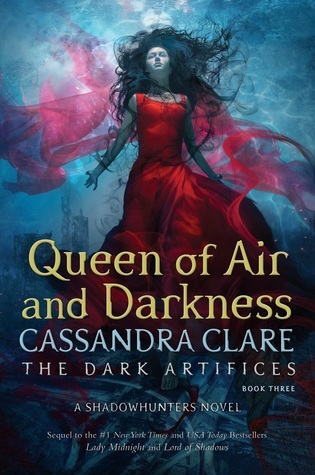 I have mentioned 1000000x that faeries are some of my favorite lore and so I doubly love TDA for sort of focusing on faeries in the Downworlder area, but I just wanted to say it again because part of this book is set in Faerie. Some faerie characters have important plot threads as well, and we have some pretty complex struggles for our half-faerie Blackthorns, Mark and Helen, so there's a lot of good faerie content in here. TIBERIUS BLACKTHORN AND KIT HERONDALE. I'm not even gonna lie — I loved these two SO much I stopped caring about Emma and Julian and their dumb curse (ok that IS a lie; I'd die for all four of them but if push came to shove it's Kit and Ty). They had a B-plot that I truly didn't see ending the way it did, and I ESPECIALLY didn't see the ending ending coming. I have nothing to say other than that I'm a shell of the human I once was. Other characters: Only Kit and Ty deserved their own bullet point. Also, I don't have much to say other than I love the other characters. Like, Cristina is amazing Emma is amazing Julian is amazing the kids are amazing and even Perfect Diego and Less Perfect Jaime came through. I love everyone except Zara Dearborn. Last thing: I enjoyed that the overarching villain wasn't a demon or a single person but an institution who the Shadowhunters were supposed to put their trust in. A true 2018 mood. Anyway tldr read this book because it's amazing and then cry with me as we wait three years for Kit and Ty to come back. If you were a Shadowhunter, what would your weapon be? Wow, this is A LOT. I never got into Clare's books and I'm honestly glad because there are SO MANY! I'm glad that you loved it though! The villain sounds great! I was wishing this would be everything you hoped for. I have got to get started on this series! Have a lovely Christmas! I loved this book, but it was a little long. I really love Kit and Ty, Emma and Julian... and I love Jace and Clary too, so I really enjoyed the short story at the end too. And the inside of the dust cover! I lived in Los Angeles when I was in college so I loved the setting to this book. Oh wow! This is a series I never could quite get lost in -- but goodness, this sounds a-ma-zing! you totally nailed why I DNF Mortal Instruments! TMI characters! though Cassandra has so many fans I'm given her book another try for sure. Especially after this great review! I have read the first book and LOVED Emma and Julian! OMG, it was the first book by CC that I have read and I loved it. I have to start the second to get to this one. I want to read them in order because these books are amazing. I... I loved the Mortal Instruments but I have to admit that I haven't read any of the other books in her other series yet. I have Lady Midnight and I just have to start reading it, so I should really get to that next year. I am glad you were able to love this one so much!